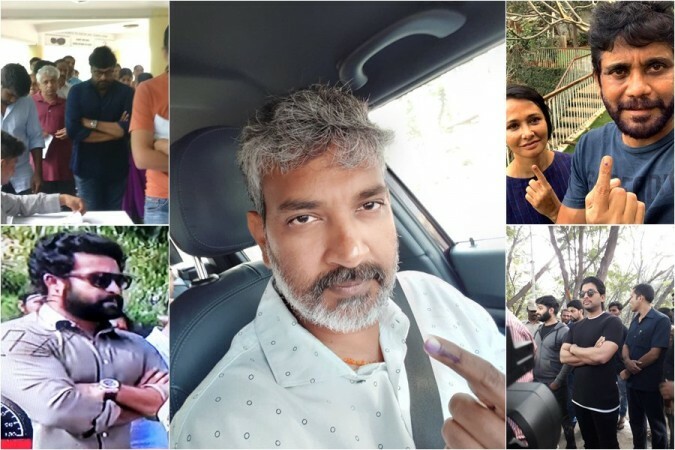 Telangana Elections 2018 LIVE: Jr NTR, Allu Arjun, Rajamouli, Nagarjuna, Chiranjeevi and many other Tollywood celebs took some time off from their busy schedules to cast their votes in the assembly polls. Mahesh Babu, Jr NTR, Allu Arjun, Rajamouli, Nagarjuna, Chiranjeevi and many other Tollywood celebs took some time off from their busy schedules to cast their votes in Telangana assembly elections, 2018. Voting is underway for 119 seats in Telangana assembly elections and over 2.8 crore people are expected to cast their vote in in the state on Friday. Most of the Tollywood celebs are based in Hyderabad, where they have voting power. Keeping aside their filmy activities, many of them headed to polling booths in the morning to exercise their power, which comes once in five years. Soon after voting, they took to their Twitter accounts to share their photos posing with inked fingers. They also requested their to take charge of their future for the next five years and take responsibility of your rights and duties. Here are their photos, videos and comments. Nithiin: I got inked!! Did u yet?? Common get out and go vote!! Gayatri Bhargavi: Early Bird me, executed my Right to #vote. Have you?